At the end of the drama, Shuichi decided to go home and visit his parents. Like it shows in the second screenshot, Shuichi stood in front of the South exit of Wakoshi Station. That day was really a beautiful autumn day, without a single cloud in the sky. Takizawa-kun and the filming crew arrived a bit late, perhaps because their previous shoot lasted longer than expected. This is the scene where Shuichi looks up at the sky, with his back facing the Wakoshi Station South exit. Taki-sama didn’t have any lines in this scene. He looked up at the sky with a small smile on his face… I guess they were trying to portray a “I feel lighter now that I’ve overcome all these difficult obstacles” kind of feeling. You can’t really tell when you’re watching the drama, but it felt that way during the shoot. Don’t know if you guys noticed this when you watched that last scene, but you can hear the sound of a train passing by the station. At the shoot, the staff actually had train timetables with them so that they could shoot the scene at the exact moment a train departed from the station. That’s impressive, isn’t it? It was a real train station, so there were a lot of commuters at the scene. A lot of the women who happened to be there were somewhat excited (to see Takizawa-kun). In the drama, Shuichi walked from the Wakoshi Station to the shopping street. 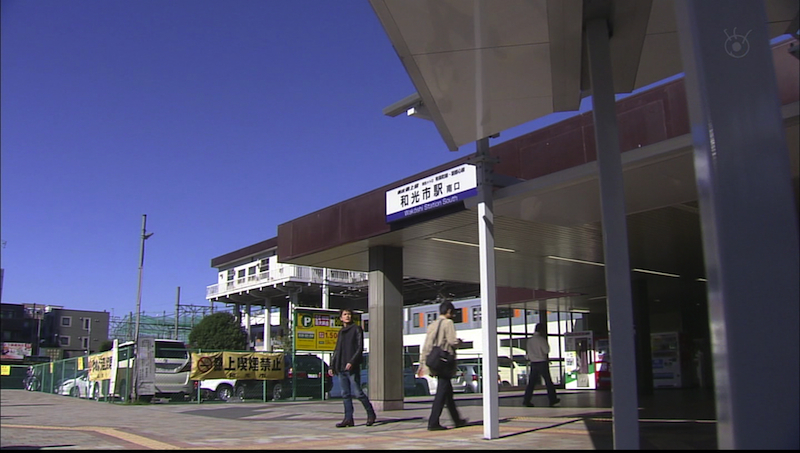 But the shopping street scene was actually filmed (in Kitaurawa) a few days before this Wakoshi Station scene. This becomes quite obvious if you look at the color of the sky (as it was blue and sunny in the Wakoshi Station scene, but grey and cloudy in the Kitaurawa scene).